The spring and summer constellation of Hercules is easily located between the bright stars Vega and Arcturus, immediately south of the northerly constellation of Draco the Dragon. The area of sky above the plane of the Milky Way contains a number of globular clusters. At the end of May, the summer constellations are moving into view for evening stargazers. In this edition of mobile astronomy, we'll showcase one of my favorites — mighty Hercules! This easily recognizable constellation features interesting folklore, some lovely double stars within reach of backyard telescopes and one of the deep sky's best showpieces for amateur astronomers. Your favorite astronomy app can help you find the treasures within Hercules and tell you all about them. Hercules' body is defined by a very distinctive keystone-shaped quartet of modestly bright stars. The keystone is about 6 degrees across (a palm's width), with the wide end to the north and the narrow end to the south. The hero of mythology is upside down for Northern Hemisphere observers. His sharply bent legs extend northward, and his two arms are outstretched to the southeast and southwest. The star marking his left hand (to the lower left) combines with four others to form a loose chain of five stars running left to right, each separated by a couple of finger widths. In classical drawings, Hercules is grasping the three-headed dog Cerberus, which he was tasked with capturing as one of his 12 labors. Hercules is the fifth-largest constellation as measured by area, and was one of the original 48 constellations tabulated in the "Almagest," an early astronomy treatise produced in ancient Greece by Ptolemy. The early Greeks depicted Hercules with his legs bent — "The Kneeler" praying to his father, Zeus, to aid him in an upcoming battle. Below his feet, to the north, are the stars of Draco the Dragon, ready to be crushed underfoot. To the southwest is the little circle of stars that form the constellation of Corona Borealis, the Northern Crown. Hercules and its treasures will be in the night sky from now until early autumn. Let's take a look at some of the best objects within the constellation. For Northern Hemisphere observers, Hercules is inverted. In this reoriented original plate from Johann Bayer's 1603 "Uranometria Sky Atlas," Hercules is shown with bent legs, a raised club and flowers. In Johannes Hevelius' "Firmamentum Sobiescianum" star atlas of 1690, he's holding the three heads of Cerberus. Hercules contains quite a few double and binary stars within reach ofthat can be viewed with a backyard telescope. One of the nicest is modest Rasalgethi, or Ras Algethi ("Head of the Kneeler"), which sits about 16 degrees to the southwest (lower right) of the bottommost corner of the keystone. In a small telescope, this star easily splits into a lovely pair of orange and greenish stars. The slightly brighter one is a red-giant-class star that varies in brightness randomly over months to years. The partner is a yellow, sun-like star that is itself a binary star too tightly spaced to resolve. The stars are about 360 light-years away and are orbiting one another witha period of 3,600 years. This double star, like many others, was given a single name centuries before telescopes revealed that there was more than one star there. Marsic ("the Elbow"), or Kappa (κ) Herculis, is another "line of sight" double star that's easy to spot in a small telescope. It's not far from Gamma Herculis. I'll leave it to you to track it down using your sky-charting app. Only a few stars of Hercules were prominent enough for proper names. The others bear the Greek letter designations of Bayer's system. Deep-sky objects are represented by symbols. On your app, tap a symbol to call up details about that object. Hercules contains one of my favorite objects, a globular cluster known as the Great Hercules Cluster or Messier 13 (M13). This object is a tightly packed ball of about 300,000 old stars. At magnitude 5.9, it is visible with unaided eyes under dark skies as a faint smudge, but reveals much more under magnification. M13 is located along the western (right) edge of the keystone, about one-third of the way from the wide end. Midway between Hercules' knees, there is another, smaller globular cluster called Messier 92. This one is also readily visible in binoculars. A third, fainter globular cluster, designated NGC 6229, is 6.5 degrees, or a palm's width, above M92. Globular clusters are one of the most interesting classes of objects for amateur astronomers. These spherical concentrations of old, densely packed stars orbit in the region just outside our Milky Way galaxy, and we've observed many of them around other galaxies, including the Andromeda Galaxy. In a telescope under dark skies, they will appear similar to a pile of salt poured onto black velvet, with a dense, white center surrounded by a sprinkling of outlying stars. Each one looks different, varying in the scattering of stars. Photographs reveal that these objects contain a mixture of reddish, blue and yellow stars in different proportions. More than 150 of these clusters have been mapped around our galaxy. They are so densely packed that the stars in their interiors are extremely close together, stirring the imagination of those contemplating extraterrestrial intelligent life. Advanced civilizations around stars deep in a globular cluster would be able to exchange radio messages on timescales of weeks or months — and travel between adjacent solar systems would not require the decades or centuries we would need to visit our nearest neighbors. In fact, M13 was also one of the first targets for potential contact with other civilizations, when a radio message was beamed there from the Arecibo Observatory in Puerto Rico in 1974. Your astronomy app lists these objects under the Deep Sky category. In the SkySafariand Stellariumapps, they are displayed using a crosshatched circle. In Star Walk 2,they are rendered as fuzzy patches. (All three apps are available for iOS and Android.) 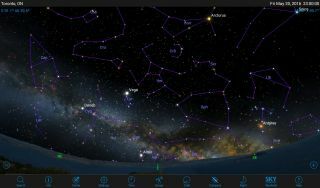 Ensure that your app has the deep-sky object display enabled as you tour around the night sky all summer, especially from more remote locations. Depending on your app, you may need to enlarge the constellation for the symbols to appear. SkySafari has an option to show objects even in wide fields. As the Milky Way climbs overhead in the summer months, many globular clusters are distributed on both sides of it. How many can you spot? The great Globular Cluster of Hercules, also known as Messier 13 (or M13), is a large and bright spherical cluster of old stars that is readily seen with unaided eyes away from city lights. A telescope reveals the salt-spilled-on-velvet appearance. The figures that constellations depict are unique to our vantage point on Earth. Each star lies at a different distance from the sun, and if we could travel to another star, the shape of the constellations would change. You can try this for yourself. In the SkySafari app, search for Proxima Centauri, the nearest star to the sun. Tap the Orbit icon, and the app will fly you there. Once there, you can use the search option to find Hercules and center it. The shape will become quite a bit different! A tap on the Globe icon flies you home again, but while you're out there, try looking at some other familiar constellations. Some will be completely unrecognizable. The Star Walk 2 app allows you to select a constellation and rotate it in 3D. You may have to purchase the additional content pack to use it. The stars of Hercules host at least 15 known exoplanets, including TrES-4, whose mass is 1.7 times that of Jupiter and is one of the biggest alien worlds ever discovered. However, its calculated density is extremely low — about that of cork! This is one of the "hot Jupiter" class of exoplanets, with a surface temperature in excess of 2,750 degrees Fahrenheit (2,000 degrees Celsius). There a number of exoplanet apps for iOS and Android, including the free Exo Planets Explorer 3Dfor Android and Exoplanet for iOS. In future editions of mobile astronomy, we'll look at photographing objects with your smartphone, some cool astronomy virtual-reality apps and hardware, how to use astronomy apps in the classroom, and more. Until then, keep looking up! Editor's note: Chris Vaughan is an astronomy public outreach and education specialist, and operator of the historic 1.88-meter David Dunlap Observatory telescope. You can contact him by email, and follow him on Twitter @astrogeoguy, as well as Facebook and Tumblr.